The BBC has been broadcasting Ghost Stories for Christmas for more than 50 years, but only now has the BFI seen fit to mine their mouldering archives and make the full collection of 12 stories available to the public on DVD (three of the stories were released by the BFI 10 years ago, but have long since been deleted). The occasion is the 150th birthday of Montague Rhodes James, principal contributor of source material for the BBC adaptations and often called the father of the modern ghost story. That a steadfastly Victorian bachelor academic has remained relevant for so long may seem incredible in our fast-paced information age, but taking such a view would be to underestimate the flexibility, modernity and basic effectiveness of James’s ghostly tales. In his 1983 biography of M. R. James, Michael Cox writes: ‘Critically, the stories have always been awarded a high place, often the highest, in the English ghost story tradition, and this estimation shows no sign of falling off.’ Thirty years later, Cox’s statement has been proved true, as the latest James adaptation for the BBC was produced in 2010, and one can only assume there will be more to come. Not all readers were instantly enthralled by James’s stories, however; his first collection, Ghost Stories of an Antiquary, garnered very little attention upon its initial publication, and the reviews it did attract were decidedly lukewarm appraisals. Despite their old-fashioned settings and Victorian academics, the stories were simply too modern in their construction for Edwardian tastes (or at least the tastes of Edwardian critics – as James and many other authors have proved, critical acclaim and popular sentiment seldom collide). James won the critics over by 1911, however, with More Ghost Stories of an Antiquary. A highly positive review in the Yorkshire Daily Observer noted that ‘the present mode of quasi-scientific horrid stories has not…been followed by Dr. James; he has rather reverted to the older fashion of genuine ghosts of the departed, not to speak of the black magic that forms the motive of â€œCasting the Runesâ€.’ In the space of a mere seven years, critical perception of James’s stories shifted from judging them too modern to be effective to just old-fashioned enough to rank among the best of their genre. Although James used setting to forge a familiarity of place and an air of plausibility with the reader, he also positioned himself as a detached storyteller to create intellectual distance based on the folkloric oral tradition out of which his stories first arose. The stories are never written solely from the protagonists’ perspectives; instead, James sets himself up as a kind of omniscient narrator who simply relates the experiences of others, effectively capturing the atmosphere of oral tradition on the printed page. In approximating the essence of his verbal delivery at the Chitchat Society meetings and Christmas time gatherings at King’s College, Cambridge, James recreates his own charismatic persona on the page, complete with his engaging humour and exceptional powers of mimicry conveyed through his dialectal characters. That the BBC would link adaptation of James’s stories to the Christmas season is no accident. The concept of connecting oral tradition, Christmas and ghost stories began at least as early as Shakespeare’s time, but it was popularised in the Victorian era with Dickens’s own invented tradition of printing ghost stories in the Christmas issues of his magazines. In accordance with his anachronistic persona, as well as his love of Dickens, James adopted this oral tradition, though it seemed to have died a natural death by the early 20th century. In following a seemingly antiquated tradition, James anticipated the eventual re-emergence of winter ghost-story telling. And in a strange twist of logic, those stories delivered by oral tradition are more believable because of their distance – it is difficult to assume narrative unreliability in the case of a man you have never met, especially when he plays golf (a fact that James exploited to the fullest in possibly his most celebrated story, ‘â€œOh, Whistle, and I’ll Come to You, My Ladâ€’). All of which brings us full circle back to the BBC’s Ghost Stories for Christmas series, transmitted via television, the medium that probably best approximates the oral tradition in contemporary popular culture. The release will consist of five discs in all, with the first two coming out on August 20 to coincide with James’s birthday month. Disc one includes two adaptations of ‘Oh, Whistle, and I’ll Come to You, My Lad,’ filmed 40 years apart. 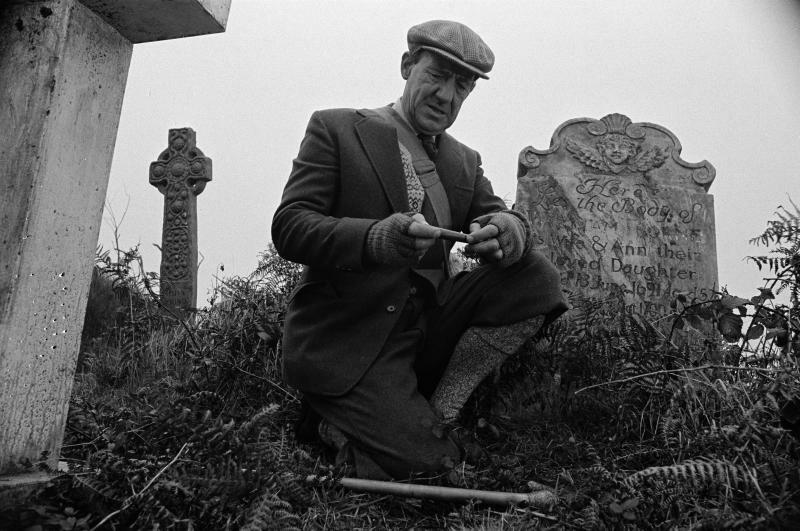 Jonathan Miller’s 1968 version, Whistle and I’ll Come to You, is possibly the most famous James adaptation for the BBC; it is certainly the most controversial, and not only for its complete lack of golf. Miller doesn’t so much adapt James’s story as use it to explore the dangers of extreme isolation, academic arrogance and Freudian repression (lead Michael Horden’s oral fixation is just a tad too obvious to be truly thought-provoking). Despite some creepy turns and a nice visual of the supernatural ‘villain’, it would be difficult to recommend this piece to traditional James fans. But it does demonstrate that James’s stories are flexible and modern enough to address updated societal fears and concerns. On the other hand, Andy de Emmony’s 2010 adaptation, also golf-less and titled Whistle and I’ll Come to You, is just too far divorced from the James original to be effective as a ghost story. It scans more as an adaptation of the Miller version by someone who has never read the original story, so while it’s beautifully shot and lead John Hurt does all he can to evoke some sort of emotion in the viewer, the whole enterprise falls flat on its narratively nonsensical face. As a basic rule, when adapting a story called ‘â€œOh, Whistle, and I’ll Come to You, My Ladâ€’, which is about a whistle that summons a supernatural terror, it might help to have a whistle somewhere in the adaptation. Disc two features two of Lawrence Gordon Clark’s adaptations: The Stalls of Barchester (1971), based on ‘The Stalls of Barchester Cathedral’, and A Warning to the Curious (1972), based on the story of the same name. Barchester, Clark’s first adaptation for the BBC, is one of the most faithful adaptations of James’s material, complete with Jamesian narrator Dr Black played with suitable affability and wit by Clive Swift. Dr Black crops up again in A Warning to the Curious, but the adaptation this time is less straightforward – one could say Clark’s biggest mistake was to replace James’s curious and likeable academic protagonist with a treasure-hunter prone to viciousness. Ghost stories often hinge on the reader’s ability to relate to the victim, and even if we can relate to the greedy lead’s deceptions, for the most part we’d rather not. Despite the varying quality of the actual adaptations, the bonus materials found on both discs make their purchase worthwhile for any James enthusiast. Jonathan Miller and Christopher Frayling’s interviews about Whistle and I’ll Come to You are insightful but too short, while Ramsey Campbell’s introduction to the two adaptations, as well as his reading of his own Jamesian short story ‘The Guide’, are essential viewing (if let down slightly by their relatively poor audio quality). As he directed most of the BBC’s James adaptations, Lawrence Gordon Clark’s introductions to his two stories provide valuable insight into an admirer of James who desired to bring the stories he loved as a child to a wider contemporary audience. Lastly, but certainly not least, disc two includes readings of ‘The Stalls of Barchester Cathedral’ and ‘A Warning to the Curious’ by Christopher Lee at his menacing best in a recreation of James’s famous ghost story readings to undergraduates at King’s College. If the adaptations let you down, these will most certainly prop you up again. Releases to come in the run-up to the Christmas box-set will include adaptations of James’s ‘Lost Hearts’, ‘The Treasure of Abbot Thomas’ and ‘The Ash Tree’. These are all worthwhile viewing, but one might delicately suggest the interested viewer read the original stories first for comparison and an almost guaranteed creepy delight.